Black Walnuts are favored for furniture ... and snacks. In the mid-1800s, most Texans bought their furniture from local cabinetmakers, and our native black walnut tree, Juglans nigra, was a favorite source of wood. That’s one reason black walnuts aren’t as common here as they once were. Many large, mature trees were turned into tables, desks and wardrobes a century and a half ago. Native throughout much of North America, J. nigra produces strong, fine-grained wood that takes a high polish. The heartwood is a deep chocolate brown, contrasting with cream-colored sapwood. Black walnut resists warping and shrinking. Gun stocks made of it are reported to have less recoil. Today, this tree is grown commercially in some Midwestern states, not only for wood, but also for nuts. The dark nutshells are thicker and harder to crack than those of the more familiar English walnut, but the meat has a fine flavor. In Texas, black walnut grows wild in places that have full sun and deep, well-drained soil. It prefers river bottoms and hillsides facing north or east. It’s a large tree with ridged, dark-brown bark and an open, rounded crown. Given time and favorable conditions, it can grow to 150 feet, but 50 to 75 feet is more typical. Male flowers appear in long catkins, female flowers in small groups at the branch ends. The foliage turns yellow in fall. Nuts ripen in October or November. 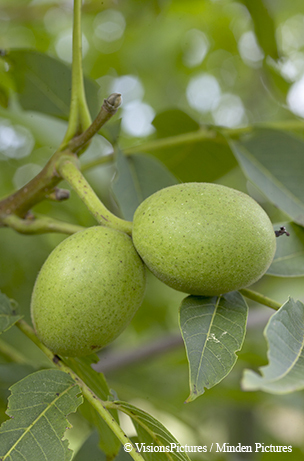 Walnut trees are in the same family as pecans and hickories, and are similar in appearance. One sure way to tell the difference is to look at the developing fruit. Pecans develop inside a seamed outer husk that splits open to release the ripe nut. The round, green husk of a walnut does not have seams. It takes action on the part of a squirrel, a human or some other hungry mammal to extract the nut. For eating, that’s best done when the husk is still green. If left on, it will eventually turn brittle and black. Leftover walnut husks stain sidewalks and patios, and have been used to make inks and dyes. In drier parts of Texas where J. nigra doesn’t grow, you may see its smaller cousin, the nogalito or little walnut (J. microcarpa). This shrubby tree, found in rocky stream bottoms and dry river beds, rarely grows more than 20 feet tall. Fruits of this species, including the outer hull, are usually under an inch in diameter. For humans, they’re hardly worth the effort to shell, but they provide high-protein snacks for rodents and other wildlife. Juglone, a chemical released by black walnut roots, inhibits plants from growing. Don't plant this tree close to your vegetable garden!